It was deja vu from the previous fixture when you looked at the programme and read that the 2 team finalist names were Purity Vodka & Drop More Wine – but due to the Drop More Wine’s team determination that is where the similarity ended. It was a closely fought game all the way through, with both teams going goal for goal in every chukka. Only Phillip Elliott’s linking up with Toby Pekjovic to score just 1 more goal in the last secured victory for Drop More, ending Purity’s winning streak of finals.‎ Patrick Bawlf and Tom Petersen were very happy with their first win of the season. Most valuable player went to Tom Petersen of Drop More Wine. 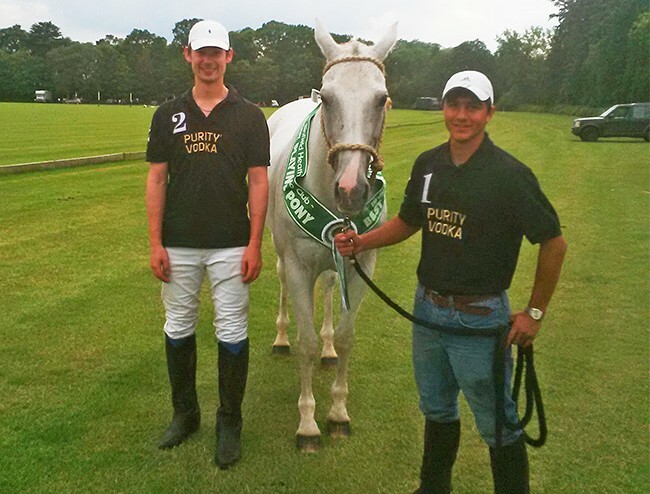 The Best Playing Pony ‎was Paloma, owned and played by Oscar Wehtje from team Purity Vodka (pictured). Both teams played well but the team work of the 2 two goalers A Perez and S Chiaivo feeding the ball to two of the Frankum family members made for a difficult combination to defend. M Castagnola and Sergio Martins tried to hold them, with good backing up from team mates Rebecca Finn and Flynn Busson but the handicap difference of the teams proved too much. MVP went to Flynn Busson, who played exceptionally well on his -2 handicap. 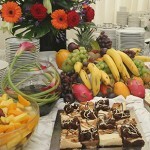 Another good game with fast running polo for the level was played by Los Gatos / Santa Helena against Adderbury Hill Barn. 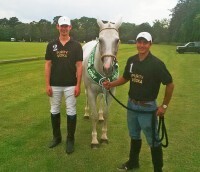 Los Gato’s professional Tomas Fernandez came flying out of the blocks in the first chukka, putting 2 goals on the board. Then Mike Revell slotted through a further 2 in the second to only one goal from Adderbury’s Tommy Llorens. This was always going to make it difficult for Adderbury to recover. With lots of help from Michael Mylonas, Katie McDonald and Lisa Spiers, Adderbury managed to put another 3 goals on the board but with Fernandez experience, and pressure in the front from Alex Brown and Clive Posselt, they made sure Los Gatos / Santa Helena kept their early lead. MVP went to Mike Revell.